Have you read any of these classics? If so, where should I start? I love classics too, but I haven't found many occasions to read them since I graduated and started blogging, as so many are long and just take longer to read. I am going to try to read some more this year, though! Middlemarch, The Tenant of Wildfell Hall, and Vanity Fair are all on my mental TBR list, as are A Passage to India, Great Expectations, and Agnes Grey. And those covers are just the prettiest ever. I want them! I've read and enjoyed both The Tenant of Wildfell Hall and The Woman in White. They're both pretty revolutionary for their time. One on social themes and commenting on women's roles and rights in Victorian England the other as an early detective novel. Middlemarch is on my TBR and I'd like to get to Cranford and Wives & Daughters sometime. Maybe Little Dorrit too (love those miniseries). 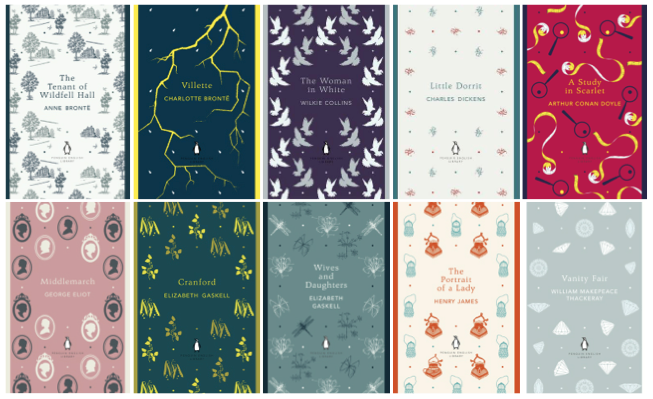 Also those covers are all lovely, one could become quite obsessed with them. Dracula is on my classics TBR. I enjoy reading classics! All of the classics I have read, I have loved and I really need to read more of them. I Especially want to read Jane Eyre, after reading a fantastic retelling of it called Keeping Katea couple weeks ago! I made a resolution to read more classics this year, so this post is a great addition to my tbr! The only one on your list that I've read is Villette, which was tough for me, but I am glad I read it. Lucy Snowe is a prickly character who really tries to keep the reader at a distance, which was hard for me. I am hoping to read The Tenant of Wildfell Hall this year as part of a reading challenge I'm doing. I'm also hoping to reread Frankenstein this year. I have never been great at reading the classics for fun, but it really is just a matter of finding the right ones for me! I love a good classic. I'm going to try and read at least ten this year. I recently read A Study in Scarlet actually, it was a good short story but I think it wasn't enough Sherlock Holmes for me to connect with. I do however love The Portrait of A Lady. It's long but has a great payoff. It's not your typical Regency Romance and I liked that. Great topic and great choices. Enjoy! I LOVED Little Dorrit! Really, really good! The Tenant Of Wildfell Hall was also really good, but very dark. I haven't read Wives and Daughters yet, but Elizabeth Gaskell's North and South is one of my favorite books. I used to read classics all the time, but I honestly can't remember the last time I cracked one open. It's been years! I read a few Henry James novels in high school, including The Portrait of a Lady (pretty sure I wrote a research paper on that one), but I haven't read any of the others on your list. I know I own a bunch, so I'll have to take a good hard look at my bookshelf and add some to my TBR for 2015. What a fantastic topic for Top Ten Tuesday!! I love this list, and I love those Penguin editions. My first choice would be The Woman in White--it's one of those books that keeps you turning the pages, whereas some other classics, like Middlemarch, take more work (you know what I mean!). Of course, Middlemarch is WONDERFUL. I LOVE The Woman in White--I discovered it when I was studying in London for the first time and had such a ball reading it. Then I would say The Tenant of Wildfell Hall, then Portrait of a Lady, then Villette, then Middlemarch! I loved Villette, but there was a certain point in the book when it really got going for me. Portrait of a Lady was a book club pick and we had such a fabulous discussion after it. So many good books in this list! Can't wait to hear what you choose first. I still need to read Cranford and Little Dorrit. I read A Study in Scarlet last year, or the year before, and I really liked it. I am hoping to get to some more of the stories this year. I vote we read Middlemarch, Vanity Fair and A Study in Scarlet together this year. Yes? I also admire your love for classics. While I do occasionally get the urge to read classics, it's very rare and not a regular thing, though I do hope I can form a habit of reading more than usual this year!